Having a family is a goal that a lot of people hope to achieve at some point in their life. The only thing about it all is that being a parent is a huge responsibility. There are a lot of different factors that you have to think about and take into consideration. For the most part both care and attention are going to be two major factors when taking care of your child. Now there are plenty of other things that you could do for your child. A lot of parents take in the fact that kids need some sort of entertainment. It can come from television, outside fun, or even throught the wonders of toys. There are so many different toy options in the world. I have a few selections for you that just might be the choices for your child. So check out all the information I have for you below. Yookidoo Gymotion Activity Musical Robo Playland – is the ultimate activity mat with three different stages. It is a mat works hard to keep baby entertained. You can turn on two different modes of 10-minute continuous music as well. Count & Build TotBot™ from Leaning Resources – using fine motor skills, they will twist color, shape, and number pieces (1–5) into place. 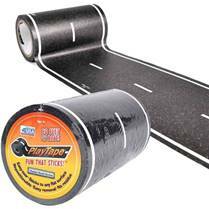 PlayTape from InRoad Toys – kids can instantly create roads and rails for toy vehicle play anytime, anywhere! Just unroll, stick, and drive! It’s hours of entertainment on a single roll. PlayTape sticks to any flat surface and is easy to tear by hand and reposition. Hot Dots Jr. Succeeding in School with Highlights Set – children can practice the skills they need to succeed in kindergarten and first grade! This interactive and multi-subject set reinforces the fundamentals and prepare kids for success. These just may be the perfect toy options fit for your child, so why not take advantage. So go ahead and check out all the information I have for you above.